Why Should You Invest in Peer to Peer Loans? Peer to peer loans are efficient by allowing members to directly invest in and borrow from each other. This removes the cost and difficulty of the banking system. This leads to more savings for investors. If an investor wants to benefit from the better returns, then they can open an account at top lending networks like Lending Club or Prosper Marketplace. Peer to peer loans offer much better returns than a bank. For instance, if an investor purchased $10000 in Lending Club Notes in June 2007 and continued to reinvest their returns, then they would have made over 9.5% net annualized returns to date. This is a better performance than a high yield corporate bond and definitely better than the stock market in the past few years. It should be noted also that top investors at Lending Club have obtained higher returns of between 12% to 13% annually, with individual investment loan portfolios going over two million dollars. Both Lending Club and Prosper Marketplace offer investors with a collection of historical as well as current information about borrowers. This information includes credit scores, income details, and other financial details. Investors can also ask questions about the borrower’s financial status before lending. An added bonus for investors at Lending Club is that they offer a no fee IRA account so that your investments can grow tax free. This is a huge reason for investors to choose Lending Club over Prosper. If you need the money before the term of the loan is up, the notes could be put up for sale at anytime. Both Lending Club and Prosper have a notes trading platform where you can price any of your loans. If you discount the notes slightly to their true value then they sell quite quickly. There are risks in peer to peer lending, because there is a chance a borrower may default. However, investors can reduce this risk significantly by diversify across a large amount of loans, and selling the notes when the credit scores of the borrowers decline. The bottom line is that peer to peer loans can be a good source of fixed income which diversifies an investor’s overall portfolio. 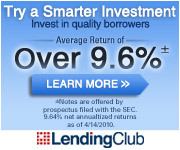 If you are interested in becoming an investor, Lending Club offers several bonus programs for investors. 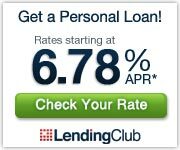 One is that if you schedule a direct deposit of $200 or more per month, then Lending Club would give you a 1% bonus. Lending Club also has other monthly bonuses available that go up to $150. How Much Can I Borrow from a Peer to Peer Loan? How Do I Sell or Liquidate My Peer to Peer Loans? What Are the Risks in Peer to Peer Lending? What Happens If the Peer to Peer Loan I Invest in Defaults? What Happens If I Can’t Pay Back the Peer to Peer Loan? How Much Do Peer to Peer Loans Cost? Which Peer to Peer Lender Should I Use? Lending Club or Prosper Marketplace? Why Are Peer to Peer Loans Great for a Large Purchase? How Long Does a Peer to Peer Loan Last? Why Should You Borrow from a Peer to Peer Lender? Why Are Peer to Peer Loans Great for Debt Consolidation?